Appliance Doctor, Incorporated test is a Pennsylvania Corporation offering expert repair services to the Delaware Valley’s residents and businesses. We started in 1964 as a one-man business servicing only washers and dryers. Today, we service more than 110 different brands of refrigeration and appliance equipment across 49 different product types. Our technicians are expected to know so much information! In the 1960’s, our service area was limited to Philadelphia. 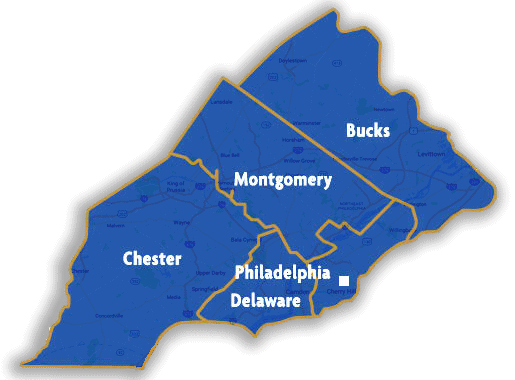 Today, our service area includes all towns in Philadelphia, Bucks County, Montgomery County, Delaware County, and Chester County. We love our customers! We have some incredibly loyal customers who have continued to trust and support our business through good times and bad. We serve nearly 10,000 customers each year. Half are repeat customers, and half are new customers. It is you who keep us going! We love our employees! We’re so lucky to have some of the best repair technicians the region has ever seen. Technicians who literally service every name brand appliance under the sun. All of our employees are “essential”. Like our bookkeeper who arrives each and every day keeping our finances in order. Paying our bills, making deposits, issuing refund checks to our customers, and so on. Our fleet manager keeps our service vans maintained to prevent breakdown. Tracking mileage across our fleet in order to schedule oil changes, filter changes, new tires, and brake pads when needed. It is a critically important job. Our sealed system technicians solve complex refrigeration problems and get our customer’s refrigerators up and running again. Our inventory manager maintains the thousands of parts stocked on our service vans and in our stock room. Without these efforts, our trucks would not have the parts needed to repair your dryer, or dishwasher, or whatever it is that you need us to repair. How about our data processors who enter work order information into our computer system so that we can answer your questions quickly and easily. Our customer service team schedules repair appointments. They also place follow up calls a few days after our service visit to every single customer. Our dispatchers have the impossible task of keeping our technicians routed in the most efficient geographical loop so that our technicians are not wasting time driving to and fro. This allows our technicians to do more work throughout the day and serve more customers. Our service manager assists our technicians when problems arise, and provides solutions to complex situations. Most of our employees are career individuals who have made a commitment to call this place “home”. Some have been with our company in excess of 20 years. They are truly dedicated to our company and our customers. To our customers, we say THANK YOU!! To our employees, we say THANK YOU! We truly do appreciate you all so very much. The year 2014 marked Appliance Doctor’s 50th year in business! We celebrate this amazing milestone. In 1964, our founder, Paul W. Guckin started Guckin’s Washer Service. A small washer and dryer repair service based in Mayfair, Northeast Philadelphia. Paul worked tirelessly literally 7 days a week for the next 20 years. Throughout these years, Paul had many different reconditioned washer and dryer stores in the city. He sold the best darn reconditioned appliances. He offered an unheard of 2-year guarantee on his machines. He was convinced that his machines were done right. Everything he did was based on quality first. In 1980, Paul renamed Guckin’s Washer service to The Washer Doctor. The name change happened after Paul’s 5 year old son, Eric, asked if dad was a “washer doctor” since he fixed sick washers. In 1985, Paul opened a massive reconditioned appliance store on Bristol Pike in Croydon, Pa. By then, he had trained on dishwashers, ranges, ovens, and refrigeration equipment. By 1987, Paul changed the company name once again, to Appliance Doctor. A name that better represented the service we offered. Our company had since expanded to Bucks County, Montgomery County, and Camden County, NJ. By the end of 1988, Appliance Doctor had registered $1 million in annual revenue. Our company had experienced aggressive growth for the next several years. The Croydon store was subsequently closed to focus strictly on the service business. In 1990, revenue approached $2 million. In June of 1990, The US government announced our country was in a recession. Due to the economic recession, the Gulf War, and other mitigating factors, business began to decline. Paul spent the next 6 years running the business as lean as possible. By September 1997, Paul came to a decision. He decided that after 33 years in the business, it was time for him to step aside and enjoy life a bit. Paul’s sons Joe, Paul, Eric, and Scott had all been in the business as technicians for some time. It was decided that the company would be spun off into 2 separate entities. Eric controlled the southern territory while Scott controlled the northern territory. Eric incorporated the name Appliance Doctor, Inc. on August 4, 1998. After a short time, Eric and Scott merged the 2 companies in order to share resources and lower costs. Eric became our company president. 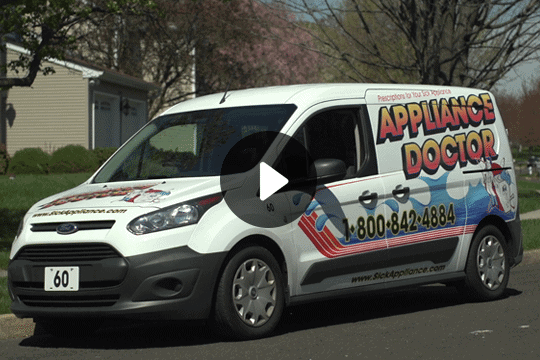 In 1998, Appliance Doctor acquired a small firm out of Willingboro, NJ named Associated Appliance Service. 1999 was a big year for our company. We moved into a 5,000 square foot facility to prepare for another aggressive expansion effort. We acquired Anthony’s Appliance Service from Northeast Philadelphia and increased revenue 214% from 1998. By the start of the 21st century, we were back on track after the recession of 1990 had really taken a toll on the business. 2001 was the year that revenues climbed back above $1 million. It was also the year that we acquired Father & Son Appliance Service from Bensalem, Pa. In 2002, we continued our expansion to the State of Delaware. Our service area now included a population of more than 7 million people. In 2004, we moved to an executive office suite located on State Road in Bensalem. Annual revenue approached $1.7 million in 2004. In 2005, Eric sold the Delaware division to his brother Paul. Paul, Jr. formed a new LLC for his division. 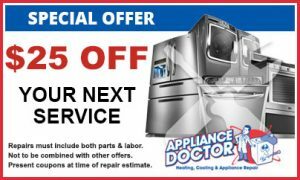 Appliance Doctor of Delaware, LLC is wholly owned by Paul, Jr. and has no affiliation to Appliance Doctor, Inc. in Pennsylvania. In 2006, Eric added the position of Managing Director to assist expansion efforts into the residential and commercial HVAC/R industry. By April 2007 after more than 12 months of preparation, we hired our first HVAC/R technician and began offering repair services on all types of heating and air conditioning equipment. At the end of 2007, Appliance Doctor had officially, for the first time in company history, reached $2 million in total revenue. We employed a total of 28 people at this time. In 2009, our country’s economy had all but collapsed. We were literally in the middle of the worst financial crisis that many of us have ever witnessed. We made the extremely difficult decision to close our new HVAC/R division after only 18 months due to economic factors. Focusing on our core refrigeration and appliance repair business was deemed the most important thing during these most difficult times. Fortunately, this decision was made early enough to maintain our stability during a very unstable time for our country. 2012 proved to be the toughest year in our company’s history. On January 17, 2012, our incredibly talented refrigeration technician, Charles Tolbert, passed away. He suffered complications from an organ transplant. He was expected to make a full recovery and return to work. This was shocking and extremely difficult for all of us to bear. We mourn his loss and will remember him as a unique and very dedicated person. He provided unparalleled service to our customers and represented our company with expertise and professionalism each and every day. In January 2013, we moved into a brand new facility. After more than 9 years at our State Rd location, we purchased a commercial property and customized it for our needs. We added brand new offices, indoor space for fleet inventory management, dedicated space for training, private parking for our fleet, and now offer drop off service for our customers. We designed this space for the comfort of our employees as well as for energy efficiency. 2014: 50 Years in Business!